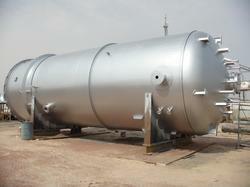 Offering you a complete choice of products which include industrial pressure vessel. To cater the variegated needs of our esteemed customers, we are highly engaged in offering a wide array of Pressure Vessels. Pressure vessels are a crucial part of the process industry. Many critical reactions need to be made in closed vessels at elevated pressures and temperatures. Some can be explosive in nature. Pressure vessels are carefully designed and manufactured equipment so as to handle such harsh conditions of temperature and pressure. Pressure vessels may theoretically be almost any shape, though shapes made of sections of spheres, cylinders, and cones are usually employed.